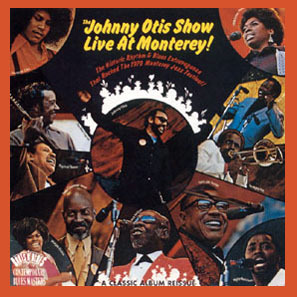 The Johnny Otis Show Live At Monterey! * Courtesy of Flying Duthman Productions Ltd. Personnel: Melvin Moore, trumpet • Gene "Mighty Flea" Connors, trombone • Presten Love, alto and baritone saxes • Richard Aplanalp, soprano and tenor saxes • Clifford Solomon, tenor sax (all tenor solos) • Big Jim Wynn, baritone sax • Shuggie Otis, guitar (Pee Wee Crayton on "The Things I Used To Do") • Jim (Supe) Bradshaw, rhythm guitar (solo on "Good rockin' Tonight"); harp • Johnny Otis, Roger Spotts, Leonard Feather, piano (Ivory Joe Hunter on "Since I Met you Baby") • Lawrence Slim Dickens, Shuggie Otis, bass • Paul Lagos, drums • Johnny Otis, vibes • Eddie "Cleanhead" Vinson, alto sax and vocals • Johnny Otis, Esther Phillips, Joe Turner, Ivory Joe Hunter, Roy Milton, Roy Brown, Margie Evans, Delmar "Mighty Mouth" Evans, vocals. The blues never has been, to my recollection, the occasion for a more joyous celebration of its uniquely vibrant spirit than on a certain day in the late summer of 1970, when Johnny Otis brought his entire azure-indigo caravan of giants to spread their talents over an afternoon on the fairgrounds at Monterey, California. Here was the consummate proof that where today's music may set up communication and generation gaps, the blues destroys them. On stage, where Shuggie Otis, 16; rhythm guitarist Jim (Supe) Bradshaw, 23; singers Margie Evans and Delmar "Mighty Mouth" (no relation) Evans, both in their 20's; and the rest of the singing and blowing battalion representing every decade on up to Pee Wee Crayton and Big Joe Turner, both in their very late 50's, and Roy Milton, who's up there at the Social Security borderline. The same with the roaring receptive, over capacity audience. Those who stood up on their seats hollering and testifying, or boogalooed along the aisles, were mostly in the 15-25 bracket, while others, less extroverted, exchanged reminiscences about the first time they had heard the call of the blues, perhaps at some half-remembered dance in the 30's, or on a 78 record player at high school in the 40's and 50's. That's what this album is all about. This is no gallery of museum pieces set up to rekindle a lost past, no futile exercise in nostalgia; instead it is a meeting ground were ages, races, and backgrounds coalesce, where grooving together is all that matters. All the other instrumental touches are emotionally strong, tonally robust products of the synthesis forged during the 1940s between jazz and R&B. Through it all, Johnny Otis remains in firm control, opening the show by reviving his 1958 hit "Willie And The Hand Jive;" soloing and comping on vibes or piano, emceeing and directing his exuberant band through its casual, largely spontaneous arrangements. There was a lot of love in the air that day. We all felt it, exchanged not only among musicians and singers, but from bandstand to audience and back. Wondering one moment why so many of the true blues pioneers had been short-changed by society, you asked yourself the next minute how a Shuggie Otis or a Supe Bradshaw could align himself so naturally with a music some thought was obsolescent. On this day the vitality of the blues ws triumphantly reaffirmed. It happened in Monterey-and not long ago. Thanks to Johnny Otis, who put it all together, and the festival's Jimmy Lyons, who brought it onstage, the whole world of the blues burst on us like sunshine on that bright September afternoon. © JohnnyOtisWorld.com. The copyright of all art presented belongs to Johnny Otis.